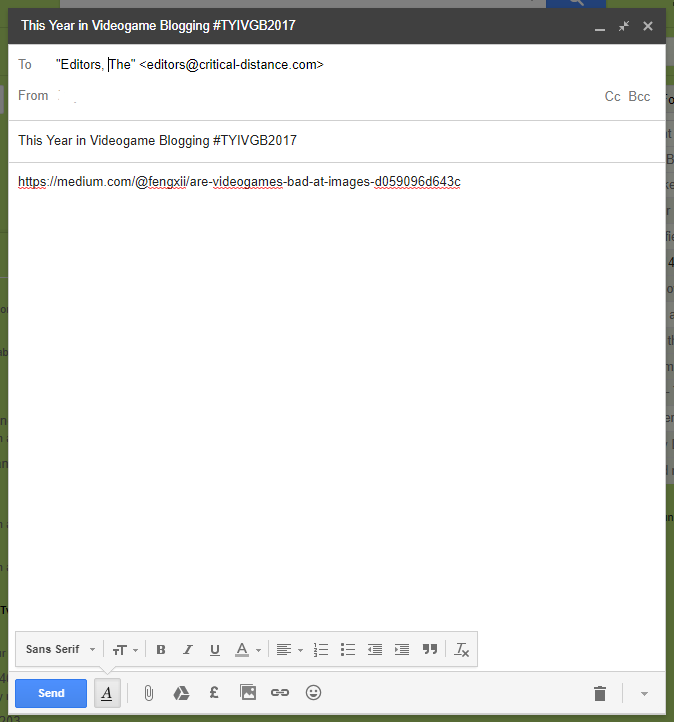 Every year since 2010, I have put time aside to look back over the year and compile from the weekly roundups one final roundup: This Year In Video Game Blogging. This is not just a “best of list” list. It is intended to be an outline of what the video game critical sphere looked like in 2017, as much a historical record as it is a retrospective. While I end up doing the grunt work, this isn’t a project accomplished solo. It is built with the help of our community showing the hotspots or pointing out those pieces we might have missed throughout the year. What work has been memorable? What work is representative of those voices doing great work? What pieces will have you referencing them for years to come? To get those piece in front of our eyes for consideration in the end-year roundup, send in links using the submission form, emails, or Twitter. Content: Just the urls. Please use a new line for every new url. No need to send commentary, explanations, or background information. Format: Plain text. No hypertext please, it makes formatting more difficult. The deadline for TYIVGB reader submissions is 11:59PM, December 23rd Eastern Standard Time. What will you remember for years to come? ‘Gamers’ don’t have to be your audience. ‘Gamers’ are over. Which games were talked about the most? For example, last year that would have included Overwatch, No Man’s Sky, Firewatch, etc. We’re looking for example pieces that highlight and exemplify the conversation surrounding those games. Which critics did notable work? This category is help acknowledge those voices that have had a constant and important presence throughout the year with their critical work. Send us pieces that best represent them. Which piece has summarized a key issue? We look for pieces that feature the myriad talking points of the debate. This goes for both industry issues and those of the culture. We prefer compilations for these complicated subjects, should they exist, in order to get a better view of the issue’s full scope, but any piece that can capture the scope and complexity is welcome. Please feel free to send in any pieces of games criticism that were simply exceptional. Whether they come from industry veterans, relative newbies to the practice or complete outsiders. You can nominate your own work. We hope you will take the time to send something in. May this December treat you better than last year’s.